Who loves their city? 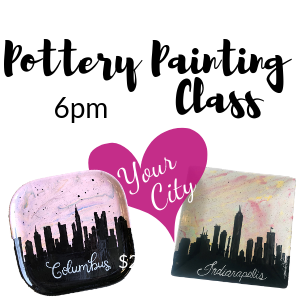 This beautiful skyline design will be the next project at Pottery Painting Class. We will use a marbling technique to make the sky and then an image transfer technique to paint the skyline. This class is instructor led, but also allows you to go at your own pace. Feel free to change colors/design to meet your wishes. Grab a friend and make plans to come paint with us! Bring your own beverage and snacks! Class reservation includes chip ‘n dip platter, paints, supplies, and a helping hand.